From his vantage as a physician, Torah-observant Jew, second-generation Holocaust survivor, first-generation American, and thinking man, Yerucham Reich shares his perspective on our lives as Jews with insights into the weekly Torah portions and the holidays. These straight-talking, commonsensical essays are drawn from life, from history, from the world as it really is, from the world as it ought to be, from the mesorah of our forebears, and from the teachings of our sages. Dr. Reich tackles everything from ancient textual questions to the controversial issues of the day with independent-minded analysis and aplomb. 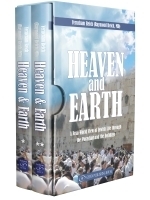 Alternately passionately serious, funny, touching, and at times lyrically transcendent, Heaven and Earth is an experience to share.